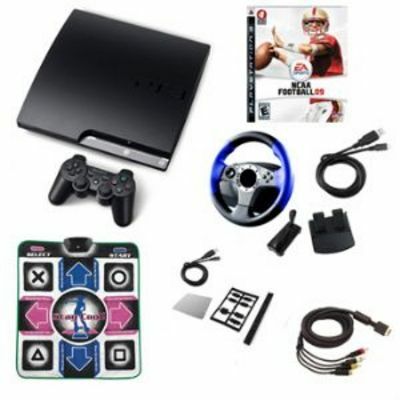 SONY PLAYSTATION 3 120GB SLIM SUPER BUNDLE W/ 1 GAME, DANCE PAD, WHEEL, FAN, CABLES, AND MORE. THAT'S $520 WORTH OF VALUE FOR ONLY $409. THIS PRICE WON'T LAST. With the PlayStation 3 120GB system, you get free PlayStation Network membership, built-in Wi-Fi and 120GB of hard disk drive storage for games, music, videos and photos. And every PS3 system comes with a built-in Blu-ray player to give you pristine picture quality and the best high-definition viewing experience available. Whether it's gaming, Blu-ray movies, music or online services, experience it all with the PlayStation 3 system. Used for enjoyment, self-teaching dancing at home and weight loss. Direct power from game console. Precision weighed and balanced wheel with 180 degree turning radius. Ensure you are ready to maximize everything next generation consoles have to offer with the Mad Catz HD Component Cable for the PlayStation 3. Experience vibrant stereo sound and ultra-realistic high-definition images to the fullest on your HDTV and immerse yourself in the world of digital entertainment. Superior sound and graphics enhanced by a premium quality component connection make this cable the premier choice for taking your PS3 gaming to the next level. Mad Catz promises you innovative, quality products for all your gaming needs. PS3 USB cable was designed for charging the PS3 controller. You can charge the controller from the PS3 console by using this cable. You can play games and charge controller at the same time. It can also be used to download data for the PSP. Wide Open and Authentic College Style Gameplay It's Wide Open - Bigger holes, cutback lanes, and open receivers, making the game feel more wide open than ever before. Directional pump fake on the R stick. New college specific tackling engine Home Field Advantage with new mini-game components - Pre-play confusion and difficulty making adjustments when on the road against tough teams. All new toughest places to play with dynamic rankings. All-new Mascot Mode with User Controlled Celebrations College Atmosphere & Pageantry - All-new Dynamic Crowd System. College sidelines are packed with additional players, mascots, cheerleaders, and more. All-new authentic fields with new textures, lighting, and field degradation. New college player models, including more than 50 alternate uniforms. User Customizable Stadium Sounds & Music. Breakaway crowd reactions Depth & Innovation - Online Dynasty. Roster file sharing online. Improved recruiting system in Dynasty mode highlighting ease and accessibility. New post game presentation and play by play commentary. 1-4 player offline co-op. Return missed field goals. Bluff your play art to confuse opponents. Formation audibles. Smart routes. Bobble catches. Better passing control. Post play continuation. All-New Mini Games. Random play selection in practice mode. Quick replay. $10 GIFT/CREDIT CANNOT BE USED TO PURCHASE THE PS3 BUNDLE. THIS DOES NOT INCLUDE SHIPPING! WHERE YOU CAN MAKE THE PAYMENT OF $409 PLUS SHIPPING. THE $0.50 YOU PAY HERE WILL BE REFUNDED TO YOU AFTER YOU PURCHASE THE PS3 BUNDLE. PAYMENT OPTIONS AT THE WEBSITE ARE PAYPAL, CREDIT CARD AND MORE! PRODUCT WILL ONLY BE SHIPPED TO THE USA (48 STATES).